During a month that seems to be filled with disastrous and sometimes horrific news about wildlife, another shocking story has just been added to the string of animal tragedies. A crocodile has died at a zoo in Tunisia after a group of people stoned it to death. The incident happened on Tuesday last week at Belvedere Zoo, located in the capital Tunis. According to reports, there was no apparent reason why visitors threw rocks and paving slabs at the animal that was unable to defend himself. Belvedere Zoo also made headlines just last year after photographs popped up online which showed animal enclosures that were full of litter, including plastic bottles, cigarette butts, and food packets. At the time of the media attention, the director of the zoo brushed off the criticism, claiming that the only reason that the zoo was in that condition was due to the very busy period, as it was during school holidays and during busy weekends with lots of visitors. According to reports, the day following the incident, Riadh Mouakhar, the Tunisian environmental minister, visited the zoo and announced that he would be doubling the number of security agents in the zoo. Together with this, he also announced that he has designating three units from the environmental police force to work full time in the park. Despite this claim, reports state that the Tunisian authorities have been promising the creation of an environmental police force since 2016. The initial launch date for this new force was supposed to be in January this year, although it was then pushed back to March 2017. 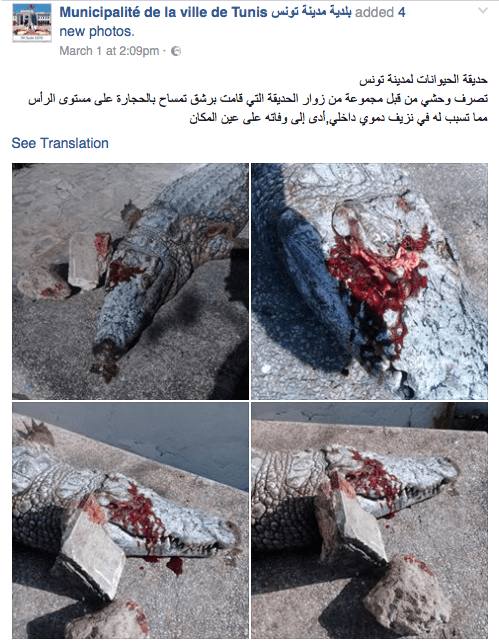 On the days that followed the death of the crocodile, dozens of Tunisian protestors began to gather at the zoo to demand an explanation, after being unconvinced by the minister’s promises. They arrived holding signs that said, “Don’t let them get away with it!” The protest was an effort to call on authorities to re-open the investigation for the death of the crocodile.